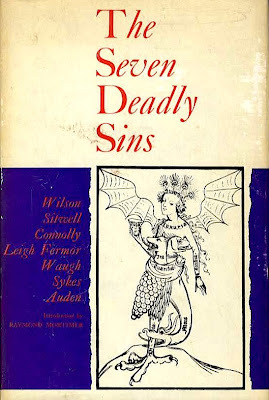 Bookride: The Seven Deadly Sins, 1962. Edith Sitwell, Cyril Connolly, Patrick Leigh Fermor, Evelyn Waugh, Christopher Sykes, Angus Wilson and W.H.Auden. THE SEVEN DEADLY SINS. Sunday Times Publications, London, 1962.
anthology 'Sometime, Never' by William Golding, John Wyndham, & Mervyn Peake (Eyre & Spottiswoode, 1956) can now be found at £50 in super condition although some dealers cheerfully hold out for £250 or more. The 1948 'Why Do I Write? An Exchange of Views Between Elizabeth Bowen, Graham Greene and V.S. Pritchett' a slim volume that looks vaguely valuable is also only a £50 note to buy. Lastly the Seven Deadly Sins is intended to be humorous and with few exceptions humour doesn't sell well. The idea for the book came from Ian Fleming who asked 7 top writers to comment on their favourite deadly sin. The result was this witty book that includes Angus Wilson on Envy, Edith Sitwell on Pride, Cyril Connolly on Covetousness, Patrick Leigh Fermor on Gluttony, Evelyn Waugh on Sloth, Christopher Sykes on Lust, and W. H. Auden on Anger. It is illustrated with 15th century woodcuts. A very fine inscription, the best kind - giving background, inspirations and secret knowlege and undoubtedly transforming a £20 book into a £500+ book. VALUE? Can be had in limpid shape for about £20, a copy of the US edition from Morrow was spotted at $20, however it was bedevilled by micronicks. This was a new word to me- presumably meaning very, very short or small nicks. Might use it myself. Meanwhile I would like to find Gordon Bottomley's 'The Mickle Drede' a great nineties rarity. Bottomley (sometimes pronounced Bumley) published his first collection of poetry, The Mickle Drede and Other Verses, in Kendal in 1896 but later attempted to destroy all copies of this book, which he considered to be immature. There are 5 copies at COPAC so he missed a few. Always a steady but unsensational seller this is obviously the black tulip of Bottomley's oeuvre and Connolly probably refers to it as an example of a notorious nineties rarity. Value? Being from Kendal it may be worth a mint. It has to be three figures but certainly not four--Bottomley is a determinedly minor writer. However there are some very well heeled collectors of nineties verse who may not have the book.